Dynamic Duos! This issue features pictures from two photographers of two different species taken from reefs at different sites in the Caribbean. How do these pictures match up? How are the creatures from two different reefs the same, and how are they different? Click the pictures below to find out. 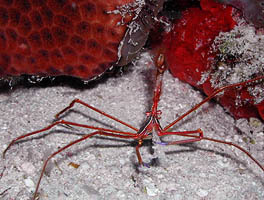 The gangly Yellowline Arrow Crab is one of the strangest crabs in the Caribbean. Photographer John Andre found this tiny crab near Bimini. Click here to read all about it. 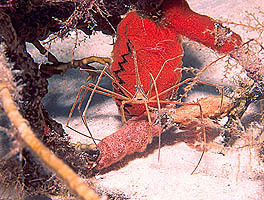 Yellowline Arrow Crabs are found throughout the Caribbean. Photographer Jonathan Dowell found this crab and its colleagues near Belize. Click here to read all about it. Schoolmasters are a type of Snapper found from Massachusetts to Brazil. 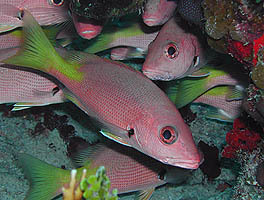 Photographer John Andre found these fish blushing pink near Bimini. Click here to read all about it. The more usual color for Schoolmasters is silver with bright yellow highlights. 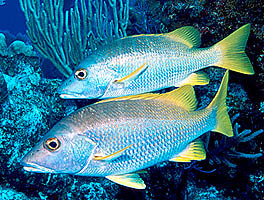 Photographer Jonathan Dowell found these fish near Grand Turk. Click here to read all about it.